The thoughts in this post have been rattling around my Homo sapiens skull for more than four days, so brace yourself. This may end up reading as though a pipe just burst in your basement. As this goes live, so do dozens, if not hundreds, of stories about Australopithecus sediba, “a new species of australopith found at the Malapa site in South Africa,” according to Science, where two studies about the new find are published. I will leave the analysis of the studies themselves to bloggers and others who actually know something about anthropology. I’ve been led to believe this is an important finding, even if “missing link” is as usual a complete misnomer. (Unless my eyes or my text finder are completely off, that phrase appears nowhere in the studies, nor in the other material provided for the press.) The scientifically curious part of my mind looks forward to learning more about it. Right now, what I’m more interested in is the circumstances surrounding the study’s embargo. Let’s review what happened. The release noted that two studies about the newly found skeletons would be published in Science on Friday (tomorrow), embargoed until 10 a.m. Eastern Thursday (today) — four hours earlier than the journal’s usual embargo time. On Saturday, at 4 p.m. British Standard Time, nearly five days before the embargo was scheduled to lift, the Sunday Telegraph published a story about the finds, including a note about a Thursday announcement. They did not mention Science, but they did mention, and quote, the lead researcher, Lee Berger, of the University of the Witwatersrand. Within a few hours, well-respected anthropology blogger John Hawks posted an item quoting the Telegraph story, and saying that he had “heard that the description will be published in Science.” The Sunday Times followed with an item of their own shortly thereafter, not mentioning Science. I got a lot of notes from people about this, starting with one Saturday night whose subject line included “EMBARGO BREAK.” Everyone, and I mean everyone, knew this was about the paper being published in Science. SPECIAL NOTE: Registered reporters, it is acknowledged that several media outlets have run “teaser” type stories based on portions of information related to fossil research described more fully and accurately in this press package. The teaser articles, appearing prior to the release of the Science Press Package, unfortunately may in some cases over-state the forthcoming research, and thus are a disservice to the goal of communicating science accurately, thereby promoting public trust in the integrity of science. These articles do not reference Science, however, and are not based upon the peer-reviewed version of this research. The Science embargo, detailed below, remains in effect. The SciPak team wishes to commend all journalists concerned with the accurate communication of research news. Let’s parse that, shall we? If the goal is to communicate the science accurately, and there’s a lot of allegedly inaccurate coverage floating around out there about a study that is already peer-reviewed and proofed, and available in PDF form to reporters, can someone please explain why the best thing to do is to wait until Thursday to release the actual study? And in the meantime, letting everyone know that breaking that embargo in order to communicate the science accurately would lead to sanctions, just like any other embargo break? It would be understandable if Science decided Easter Sunday was not a good time to lift an embargo early, and had instead sent out a note saying they would release the study Monday morning, in whatever time zone they chose. But they didn’t. It’s worth noting that lifting an embargo and punishing the breakers are two separate things that can operate independently from one another. It might take time to figure out what The Telegraph knew, and when they knew it. It shouldn’t be hard to connect the dots between an NSF press release and the story, if that’s what happened, but that will require effort. Fine — it would be understandable if Science decided to lift the embargo before they had time to figure out whether to sanction the embargo breakers. Science has used a panel of reporter-advisors for similar tasks in the past. But if waiting for an adjudication on that was part of the delay in lifting the embargo, I’m not on board. The fact is, everyone who had agreed to the embargo — including me — was sitting on their hands. Whether or not the people who broke the embargo had access to the embargoed material, and therefore broke it, is relevant to the decision about how to sanction them. It is not relevant, despite the careful language of the Special Notice, to whether the embargo was broken. It was. I very much doubt that an institution embargoing something in another sphere of life would have been allowed to get away with leaving the embargo up for five days after such a break. “Hey, the Gazette is reporting that the chair’s report will call for Smith’s resignation.” “But we have the report, it says no such thing, just says he used poor judgment.” “Well, it’s embargoed until Thursday, so we’ll have to wait.” Inconceivable. Put another way: Saying that leaving the embargo in place is in the interests of more accurate science communication is like saying a four-hour embargo “gives the media time to learn about a topic, gather relevant information, and interview authors and other experts so they can accurately report complex research findings” — which The New England Journal of Medicine essentially did last month. I of course contacted AAAS Office of Public Programs director Ginger Pinholster for comment, starting with an email Sunday. It was an understandably hectic week, and Ginger said she’d get back to me. I’m sure she will, since, as I’ve noted, she’s always been responsive to questions. In the meantime, though, I just had to post my thoughts. For what purpose? Control. I’ve said before, self-interest is a perfectly reasonable human motivation. And if journals were more honest about that in their embargo policies, I’d have a lot less to write about. But when they use better science communication, and better journalism, as the rationale for their policies, I’m going to call them on it. Updated 1:08 p.m. Eastern, 4/8/10: As The Sunday Telegraph’s Richard Gray — please see the comments he emailed me below — notes, his story did not quote Lee Berger. I’ve struck that above. Please also see thoughtful response from Ginger Pinholster below. I interpreted the timing of the embargo as coinciding with the big press conference that was arranged for today. So perhaps they judged it was better to keep it up, to maximise the impact. I don’t know if that was the right decision, but it does make the whole thing even more complicated. Dear Ivan, I’m sorry that I wasn’t able to call you back immediately while this episode was still in play. I had still intended to be in touch following a reporter-advisor conference call tomorrow. Your post includes some speculation, and you’ve left out several critical details: Specifically, the Sunday Telegraph report of a “missing link” (a term not used by the researchers or in any of our press materials, as you noted correctly) did not mention Science, the species name, or in fact any details relevant to the scientific punchline of the papers. Lifting the embargo preemptively based on that level of teaser story would have resulted in monumental inconvenience for the vast majority of our 6,800 registered reporters, particularly because I literally did not have any way to get the peer-reviewed information to them early on Easter Sunday morning from Florida. My primary concern at that point, as I explained to you in my first email response, was to locate my chief programmer so that he could manually trigger the SciPak, which otherwise is auto-posted much later on Sundays. We were able to accelerate that process. The next step was then to determine whether the greater good would be served by staying the course, given the scant level of detail in the teaser story, thereby giving journalists a chance to read the very large volumes of material and to interview the sources. We decided to go the latter route. My thinking was that I wanted to avoid putting journalists in a position where they would have to scramble so much that they would be forced to simply repost the unfortunate “missing link” teaser. I received no pushback on that decision from the Associated Press, the New York Times, the Washington Post, or anyone else who contacted me directly, other than The Times of London, which published a variation of the Sunday Telegraph teaser. Incidentally, the NSF misfire, while distressing and unacceptable, seemed to be completely unrelated to the Sunday Telegraph teaser. Our staff had checked NSF’s distribution list in the wake of that incident, after the NSF had issued a correction, and there were no U.K. connections. My first notice of the Sunday Telegraph problem was a message on my iPhone from a reporter who forwarded to me a message that you had sent to her with the subject line “embargo break.” That message said, “This is clearly a Science break,” and it included a link to the Sunday Telegraph story. It wasn’t clear to me whether you had sent the email specifically to that reporter as part of ongoing discussion with her, or as part of some listserve communication. I then heard from Hannah Devlin of The Times and her boss Mark Henderson. They wanted to be able to respond to the Sunday Telegraph information and so they made their case to me by phone. Again, however, because the Telegraph piece included no mention of Science, no details regarding the research, and as noted, I had no mechanism for getting the correct information to Hannah, Mark, or anyone else, I declined to lift the embargo. I explained to Hannah and Mark that we typically do not lift the embargo in response to teaser stories that don’t disclose the punchline or reference us. I urged them to resist the urge to simply re-publish the “missing link” story. They re-posted a version of the Sunday Telegraph story anyway. How did the Sunday Telegraph get wind of the story before the Science Press Package was distributed to anyone? I don’t know, but I can tell you that the authors and their institutional representatives offered strong assurances in writing that it was not them. As you noted, they were concerned with their event today, and they had been working very well with us to try and achieve a smooth dissemination. What can or should we do about this trend of inaccurate teaser stories, which always seem to occur in the United Kingdom on a Sunday? I don’t know the answer to this question either. Maybe the reporter-advisor group will have some thoughts. In closing, I’d like to emphasize that I welcome embargo-released questions, and in fact, I’m happy to be as accountable and transparent as I possibly can be. I understand that you don’t like embargoes, but my job does include embargo management. I try to approach this task humbly, seeking advice and other perspectives, as appropriate. Often the decisions are not black and white. I do the best I can, often with a little help from long-time colleagues in journalism. I’ll apologize up-front if I’m not able to phone you back immediately when a fast-moving event is still actively in play, as it was this week. I wanted to share a more thoughtful analysis with you tomorrow after I’d had a chance to speak to others and also gather my own thoughts about what lessons might be learned. 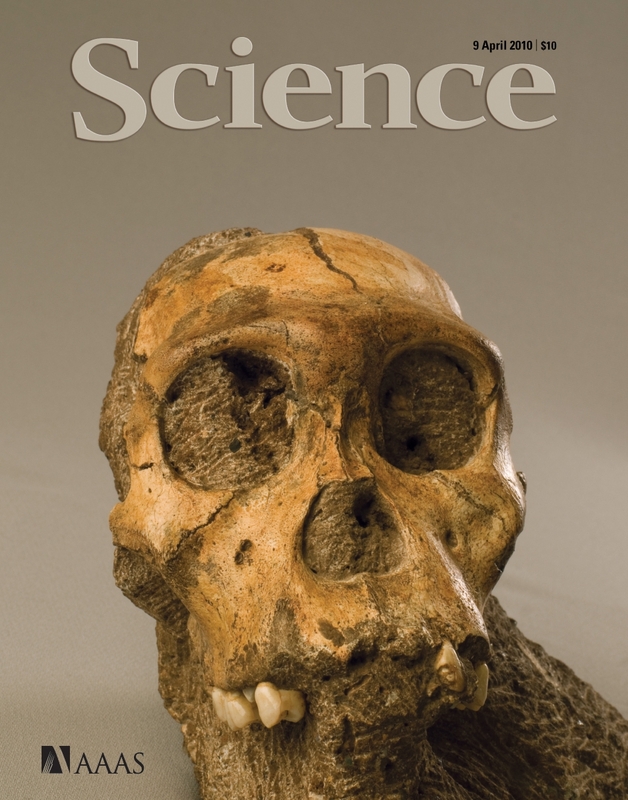 At any rate, I’m delighted to see the vast array of accurate, comprehensive coverage now in the public domain related to the analysis of the Australopithecus sediba fossils and their environment. Listening to David Perlman and Lee Hotz and Dan Vergano and so many others asking questions on the teleconference yesterday, I felt very hopeful for science journalism. Many thanks for the thoughtful response, Ginger. I’m glad to have a conversation going about this incident, and it may be that Richard Gray’s response, which crossed paths with your comment, may answer some of your questions. A few minor points: I did note that The Sunday Telegraph did not mention Science, but you are correct that I did not indicate that they did not mention “the species name, or in fact any details relevant to the scientific punchline of the papers.” Those are fair points, and I am happy to agree to disagree about whether mentioning a find, the lead author, and a Thursday embargo is a break or not. (I would also reiterate that at least one other outlet had named Science.) I don’t agree with your rationale, but I understand it and appreciate having you spell it out here. As far as the email I sent to a reporter you mention, that was sent to a single colleague here at Reuters, not to any kind of listserve. I knew that colleague would check with AAAS before publishing anything, which is what happened. Reuters didn’t run anything until the embargo lifted at 10 a.m. this morning, and wouldn’t have as long as we had not heard the embargo had been lifted early. I should also note the reason I did not mention anything from your emails (except that you said you would get back to me, which I knew was genuine), namely that you had said this backstory was under embargo. I didn’t want to assume that embargo would lift when the paper did — I actually figured it would lift when we were able to speak. Happy to have that clarified. Those last two paragraphs bring me to my last point, to respond to the comment that I don’t like embargoes — which I clearly followed here. I don’t think I’ve said anything to indicate that’s true, nor do I feel that way at this point. If I haven’t been clear, these are the two things I really don’t like, and have been doing my best to point out on Embargo Watch: Inconsistency, whether in access to embargoed material or sanctions; and justifying specifics of embargo policies, and their implementation, based on better science communication while leaving out the control they allow journals and others to exercise. It’s the latter I am respectfully taking issue with in this case. I look forward to continued dialogue with you and others on Embargo Watch, and once again want to thank you for taking the time to respond during what I’m sure continues to be a very hectic week. I liked your piece on the Australopithecus sediba story and Science embargo and thought I would throw in a bit about what happened from our end. We were first told about the find several weeks ago by a very reliable source who gave us details about what had been found and that there was due to be an announcement in April. I then started making enquiries about the story to other people in the palaeoanthropological world about what they knew and had heard, before approaching Professor Berger himself two weeks ago. For the record, he did not speak to me and said the story was going to be appearing in Science. His press office also mentioned they would be having a press briefing on the day of the Science publication. He was clearly right to not want to talk about it, as doing so would have endangered the publication of his paper under Science’s embargo policies. Last weekend, we decided we had enough to run a story from sources that had not come from embargoed information and so published. Should Science be able to put an embargo on information that has not come from them and has been obtained from other sources? Ginger Pinholster emailed me on Sunday night. They are currently discussing with reporter-advisors about what to do (although I suspect I may be in line for a Eurekalert account suspension). For the reasons I outlined in my last email, I feel this will be unjust, but I do appreciate the frustration that other journalists have when a story breaks early. On a personal note, I feel it is sad that publications like Science and Nature are trying to stifle good old-fashioned “scoops” with their dictatorial embargo policies. It is leading to an ever increasing tide of churnalism. I have separate issues with the quality of press release that is also now allowed on Eurekalert, but that is perhaps another issue for another time. This is reminiscent of the way in which Dolly the Sheep made her first public appearance some 15 years ago. There too a British Sunday newspaper, The Observer, had the story from other sources, pre-empting coverage of a paper in Nature. Back then there were similar shouts of “foul” and accusations of broken embargoes. The real lesson from this story is that the best way to do science journalism is to ignore the embargo system and to do what Richard Gray did, good old-fashioned reporting. The embargo relationship is basically a gentleman’s agreement. Sure, anyone can violate a gentleman’s agreement — it’s what one would expect of a weasel. Good old-fashioned reporting involves finding out facts that no one else knows and writing about them in an accurate, fair manner, not some slapdash attempt to scoop others on information they already know and had agreed not to talk about in order to write a better story. Sometimes you let a scoop go in order to get the better story afterward and behave like the better man — there’s always other news. My, such a superior attitude. Does this mean that “old fashioned reporting” is fine unless there is a paper somewhere in the system? What happens when a reporter comes across a story, works it up, and then discovers that someone is about to publish a paper? Do they then just abandon all that work lest they be accused of being a weasel? There is nothing in Richard Gray’s message that suggests, to me at least, that he “had agreed not to talk about” this story. You seem to be making some assumptions about what he did and didn’t do. Perhaps you have evidence that the rest of us have not seen. It is naive to think that “scoops” have nothing to do with beating everyone else to the punch. A reporter who was never party to the agreement of the embargo is clearly not bound by the embargo. If someone not bound by the agreement finds out they every moral right to publish what they know. If a reporter is provided the information on the condition that he not publish prior the public announcement then and only then can he be expected to refrain from publishing during the embargo. I wouldn’t say that reporters who were never party to an embargo agreement have a moral right to publish what they know, but agree they are under no ethical obligation to withhold information. In many ways, an embargo agreement to me resembles the arguments surrounding whether to disclose what is on-the-record, off-the-record, on-background, on-deep-background, etc. It’s not as if the reporter is the only one who has to consider the hazy customs involved — the scientists, the publishers, and anyone else in the know should think about the consequences of talking or not talking. I think that’s what Ivan’s trying to accomplish here. Given that I myself on at least four or five occasions have found out about papers appearing in Nature, Science or PNAS three to six months or so before they ever appeared in print, I sat on them, to not jeopardize their publication and to not jeopardize my standing with the journals. You hopefully then can write up a story with more context and detail than anyone else on hand when the embargo lifts. The scoops I’ve had have involved me contacting researchers up to years before publications have even been drafted yet by actually visiting researchers on site and seeing the work being done there — visiting paleontologists out at digs, for instance, or seeing mummies archaeologists dug up, or going to labs and seeing the work done firsthand. Or I’ve gotten scoops digging through obscure journals no one’s looking at for stories — it wasn’t all that long ago that the NEJM was obscure for reporters. To me, that’s old-fashioned reporting — seeing something in the field, or looking places others overlook. And if you run across work that’s embargoed, well, that’s a hazard of the job, much like dealing with junkies and thugs is a hazard of crime reporting. At worst you lose a story — there’s a lot of news every day, and you just go on to try and win the next battle. I beat people to the punch all the time by being observant, not by breaking a gentleman’s agreement.